New York State Assemblyman Marc Molinaro, who represents Columbia County (R,C,I-Red Hook), will host a town hall meeting in Ghent on Thursday, May 27 from 6 p.m. to 8 p.m. at the White Stone Café, 2337 Route 66, Ghent. Assemblyman Marc Molinaro (R,C,I-Red Hook, representing much of Columbia County) will host a town hall meeting with local residents on Saturday, May 29 from 10 a.m. to noon at the Simmons Way Village Inn, 53 Main St., Millerton. Marc Molinaro will announce he is seeking re-election for the 103rd Assembly District with three events on Friday, April 30 in Dutchess and Columbia counties. Molinaro will be at Promenade Hill (intersection of Front and Warren Sts.) In Hudson at 11 a.m., at Tivoli Commons (86 Broadway) at 12:30 p.m., and in Pleasant Valley at GE Masten Feed (1 West Rd.) 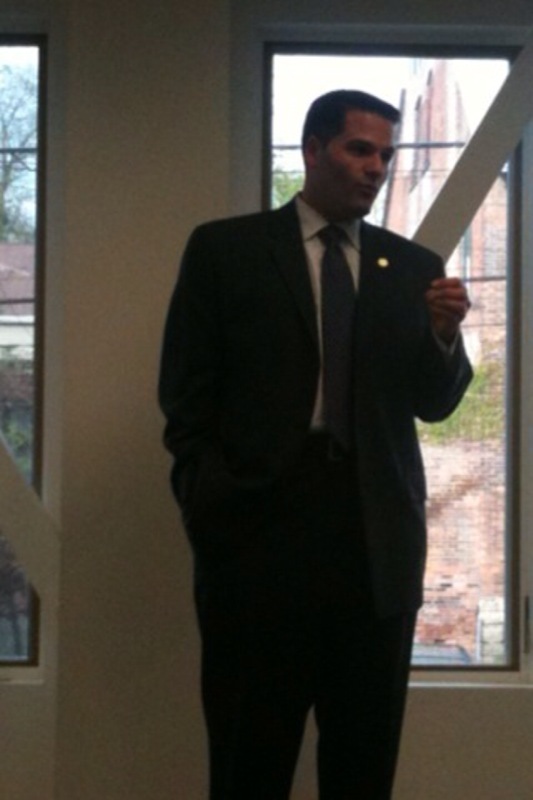 at 2 p.m.
Assemblyman Marc Molinaro (R,C,I-Red Hook) brought State Assembly Republican Leader Brian M. Kolb (R,I,C-Canandaigua) to a public meeting of about 20 people at Space 360 in Hudson today at 5:30 p.m. The two Assemblymen mingled with the guests including Catskill Town Supervisor Peter Markou, Columbia County Planning and Economic Development Commissioner Ken Flood, and Bill Jacoby, whose NYC-based Wind Products is looking to manufacture wind-power generators in Columbia County in two years. Molinaro spoke with a WGXC reporter for five minutes before a public question-and-answer session with Kolb that lasted over 30 minutes. Audio mp3 recordings of the interview and questioning are below. The event preceded Molinaro and Kolb’s public forum to discuss the People’s Convention to Reform New York Act at the Hudson Elks Club. NY State Assembly Minority Leader Brian Kolb, Catskill Town Supervisor Peter Markou, and State Assemblyman Marc Molinaro at Space360. Assemblyman Marc Molinaro (R,C,I-Red Hook) brings State Assembly Republican Leader Brian M. Kolb (R,I,C-Canandaigua) in hosting a “Meet and Greet with Legislative Leaders” in Hudson on April 21. 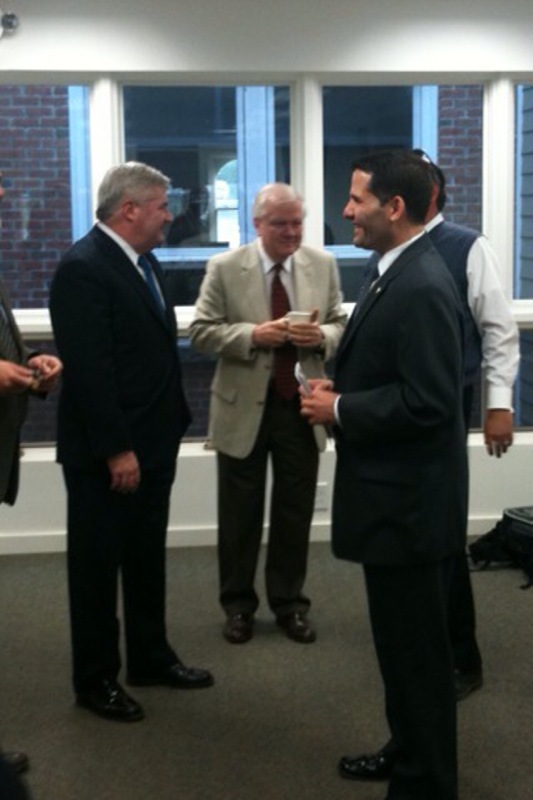 Molinaro and Kolb will meet with Chamber of Commerce guests at Space 360, 360 Warren St. in Hudson from 5:30 to 6:30 p.m. The event will precede Molinaro and Kolb’s public forum to discuss the People’s Convention to Reform New York Act, which will be open to the public and take place at the Hudson Elks Club at 7 p.m.